Ann Taylor's Cyber Spring Event is currently under way! This is a pretty big deal, guys -- one to definitely get excited about. As a longtime shopper of Ann Taylor, I can tell you first-hand that they rarely run promos as good as this one, especially with free shipping. Usually, you have to meet the $175 minimum requirement to qualify for it, or pay their $8.95 flat-rate shipping fee, which is a pain when you only want to pick up a few items. Several of my favorite AT pieces shown above are still available and are such a steal! My favorite blush tweed blazer that I've worn countless times is now only $75 -- such an amazing price for a beautiful, well-fitting blazer! Also, the navy knit peplum sweater I'm wearing in the photo collage above (bottom-right photo) is now less than $8 and available in all sizes! Refer to my previous fitting room reviews here and here on these pieces for more photos and details on fit, fabric, etc. 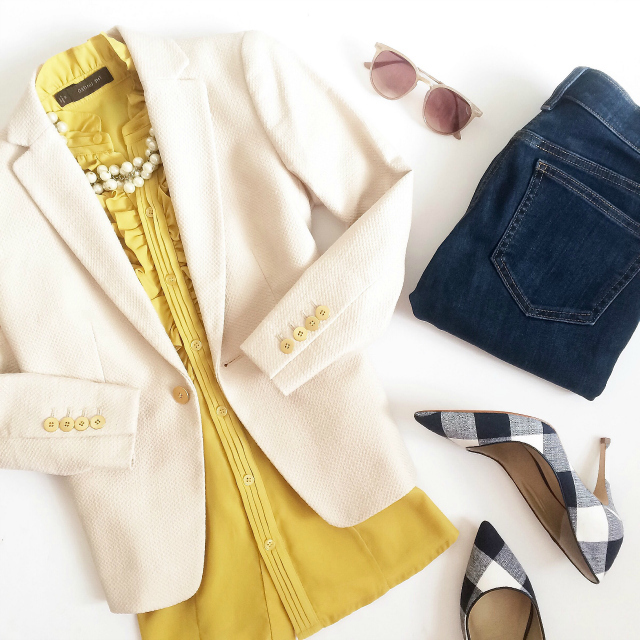 My favorite cream textured blazer (size 00P) shown here is also included in the sale, comes in regular, petite, and tall sizing, and is now only $84.50! I'd say a good 80% of my office attire is comprised of Ann Taylor (or LOFT) pieces; the styles are classic yet modern, elegant, and feminine. 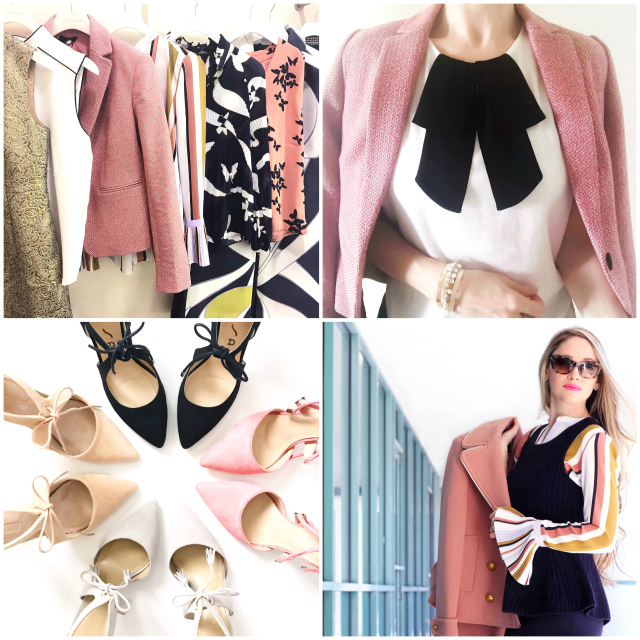 If you're just starting out in the workforce and need a few affordable pieces that will serve as a foundation to your work wardrobe, or if you're just looking to refresh your wardrobe with a couple of new and versatile picks without over-spending, then this is the ideal time to do it! So, what do I recommend? See my picks below. Each of these pieces are good, solid building blocks worthy of the investment in their own right because they will take your office style far. Depending on your personal preferences and/or your office dress code, you can always make adjustments along the way that will reflect your own sense of style. Infusing more colors, fun patterns, or pieces with special details like ruffles, scallops, pleats, and tie-neck collars (my personal favorites) are a great way to do this, and you'll notice your style evolving into one that suits you best, boosting your self-confidence and making you feel beautiful and empowered. Having the option of mixing and matching these go-to pieces for limitless outfits is key, and with proper care, they'll last you years. Taking advantage of sales like this amazing Ann Taylor Cyber Spring Event can help really stretch your budget, too! If you're looking for some style ideas/inspiration for work outfits, please see some of my previous blog posts here, here, here, here, here, here, here, and here. I hope you find them helpful! I also share several of my workwear stylings on my Instagram gallery, so be sure to follow me if you're not already! Before I wrap up, I'm leaving you with a few more of my AT sale picks. Just scroll through and click on the photos for more details or to shop. I'd love to hear which pieces are your favorite! Happy shopping, and thanks so much for stopping by! Spring Break Picks / Family Vacay Plans!